Renowned guitar wizard Chris Impellitteri's IMPELLITTERI have revealed a shredding cover of a theatrical classic, "Phantom Of The Opera", via a brand new music video directed by John Logsdon, also recognized for producing music videos for the likes of Eric Clapton, DEF LEPPARD, and many other notable artists. Editing duties were managed by Patrick Dwyer. Watch the brand new music video now on KNAC.COM right HERE. Chris Impellitteri jests, "It's great to have both the legendary actor Lon Chaney (the Phantom) and Mary Philbin (Christine) join our band for this song and video, they are amazing actors!" He adds,"On another amusing note, our singer Rob Rock wanted to kill us for making him wear the mask in the video... but in the end he manned up and put it on to celebrate the Phantom's story and theme, even though he knows the internet trolls are going to ridicule him... ha! Rock is such a fantastic singer to work with, a real team player!" 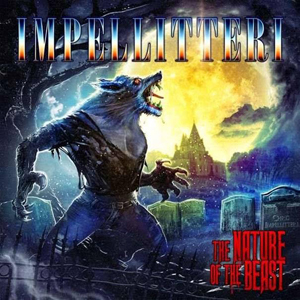 IMPELLITTERI's blazing cover of "Phantom Of The Opera" can be heard on the band's latest album, entitled The Nature Of The Beast, released via Frontiers Music srl (North America and Europe) and JVC Victor (Japan). The Nature Of The Beast was recorded in Los Angeles, CA with legendary engineer/producer Mike Plotnikoff (VAN HALEN, AEROSMITH, IN FLAMES), mix engineer Greg Reely (OVERKILL, FEAR FACTORY), and engineers Jun Murakawa and Sean Shannon. The band recorded the album at NRG studios and IMP studios. Chris states that "Phantom Of The Opera" is a song he has wanted to cover since he was young, and in comparison to other popular covers of the song that have been released, he feels their version keeps Andrew Lloyd Webber's masterpiece close to heart. He adds, "When we created our musical arrangement for this song, our collective band vision was to basically take the Phantom on a wild musical ride thru hell! We wanted to turn the song into a speed/power metal type song. I will say our version of this song can seem fairly challenging to play as a guitarist due to the various complex scale sequences, modes, and speed at which we are playing. At the same time, the lead vocals are quite brutal on our singer Rob Rock as he had to sing both the male tenor part as well as the female vocal which resides in the alto and soprano ranges. I am fairly certain most male vocalists in the metal world who can actually sing (or at least sing like Ronnie James Dio or Bruce Dickinson), will recognize that Rob Rock really had to optimize his vocal range and power in order to pull this performance off. We have to remember this music was originally written for trained opera type singers." To record "Phantom Of The Opera", Chris Impellitteri utilized his Charvel custom shop Stratocaster and various vintage modified Marshall amps, pedals, and speaker cabs, while bassist James Pulli achieved a great, growly bass tone with his Spector Bass and vintage Ampeg SVT rigs. Keyboardist Ed Roth nailed the sonic integrity of the vintage pipe organs, while drummer Jon Dette created a nice foundation for maximum guitar rippage. IMPELLITTERI are now preparing to tour the world in support of The Nature of the Beast. The band's 2016 live shows in support of their Venom record saw the band play to massive crowds around the world including appearances at Rock Fest in Barcelona, Spain, Bang Your Head Festival in Germany, sold out dates in Japan, and a headlining appearance at the Busan Rock Festival in South Korea where the band headlined to an estimated 90,000 people. IMPELLITTERI will be playing live starting in summer of 2019! "Do You Think I'm Mad"